November marks the end of meteorological fall; the time meteorologists and climatologists alike define by the start of a cooling annual temperature cycle that leads to winter. Why the difference between meteorological and astronomical seasons? 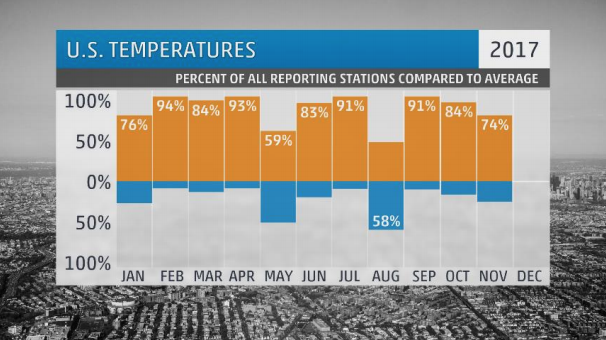 Atmospheric scientists break seasons down into three month clumps according to yearly temperature trends. Data shows, and you’ve no doubt witnessed, that winter is the coldest time of the year and summer is the hottest. The same can be said for fall and spring being transitional seasons – cooling down in fall and warming up in spring. Well, the same data also shows that these finding do not follow the astronomical cycle that we use to define calendar seasons. Instead, the best results are found clustered into, oddly enough, four sets of three 30-ish day months. November comes on the tail end of meteorological fall which consists of the months of September, October, and November. Compared to the astronomical cycle, a deviation of about three weeks separates it from the meteorological counterpart. So, when you hear your friendly neighborhood meteorologist talking about the warmest or wettest fall on record, they are almost always referring to the period beginning on September 1st and ending on November 30th. Coming at the tail end of a transition season can mean one of two things: November can either be explosive or a dud. On one hand, an active weather pattern with shots of Arctic air battling the last bits of fall warmth can lead to dynamic weather coast-to-coast. On the other hand, a stagnant weather pattern can lead to stale, meandering conditions where persistence forecasting can last for days and days. So, was this November one to remember or one to skip over? Let’s find out! We start in the 33rd largest city in the US: Tucson, Arizona. All thirty days of November were above average in Tucson. In fact, every day was at least four degrees above average. For most places in the US, that’s a tall task to achieve. However, incredibly persistent heat was able to lock in over the Southwest during the month of November and bake residents there like a tray of cookies. 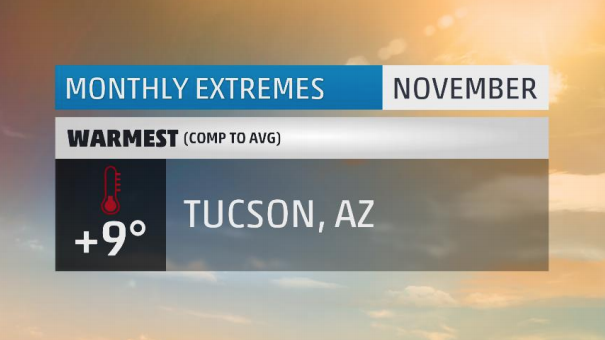 For Tucson, this was their warmest November on record at just over nine degrees above average. In a month where high temperatures typically fall from the upper 70s into the 60s, 24 days this November were at 80 degrees or higher! That’s the second highest number of 80 degree days on record. Conversely, in a month where low temperatures fall from the low 50s into the 40s, 24 mornings started at 51 degrees or higher. That is the highest number of warm November mornings on record in Tucson. They even managed to set their 2nd warmest November morning low at 66 degrees. The records don’t end there. Tucson hit 92 degrees twice at the end of the month on the 26th and 27th. The previous latest 90 degree day for the city was November 22nd. Assuming Tucson stays south of 90 degrees during the month of December, these will stand as the latest 90 degree days on record. Eight record daily highs were set during the month along with two record warm low temperatures. For Tucson, this was their 2nd warmest fall on record and they are currently working on their warmest year. Fun fact: each of Tucson’s top five warmest years have all occurred in the past decade. Well…I guess that’s not a fun fact for them. Speaking of hot weather, November was yet another month this year to have more cities with above average temperatures than below. Currently, 10 out of the first 11 months of 2017 have featured runaway heat in the US. We will wait to see if December bucks or keeps the trend. We head 1,000 miles north and 4,000 feet up in elevation to reach our coldest spot this November: Bozeman, Montana. Bozeman nationally ranks as the 13th coldest US city on average, and joins three other Montana towns to round out the top 25. 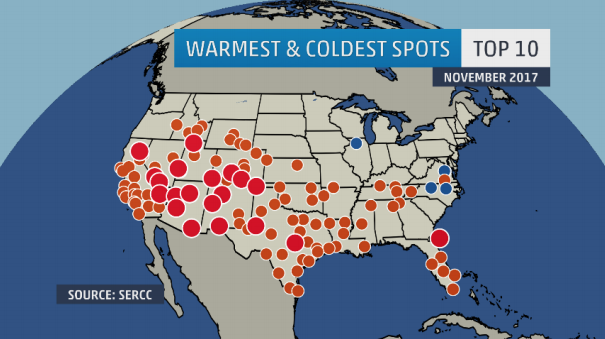 This November, some of the only cold to be found in the US resided in the northern Rockies. Bozeman had its 23rd coldest November on record which is statistically not a lot to shake a stick at. Eighteen of November’s 30 days were below average. Nine of those days were at least 10 degrees below average, five were at least 20 degrees below average, and two days managed to come in at 30 degrees or more below average. Having one day in a month be at least 30 degrees different from average is impressive enough! Its coldest morning registered at 12 degrees below zero and was accompanied by a 14 inch snow pack – Mother Nature’s refrigerator. That morning low also set a daily record, so there’s that. 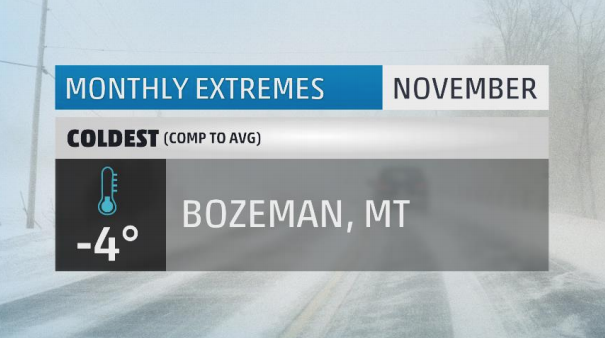 Bozeman did manage to have its 3rd snowiest November on record with 15.9 inches of snow. That was enough to be the second snowiest location in the US this month. Note that their average November snowfall is only 5.9 inches. This was Bozeman’s 19th coolest fall on record. A flip-flop month of temperatures kept much of the northern-tier of the US out of monthly extreme temperatures. Meanwhile, pretty unchangeable weather persisted from I-40 southward. There, heat was able to lock in, build, and bake those under its dome. Over 120 cities had one of their top 10 warmest November’s on record including: Las Vegas and Midland, TX which had their warmest. 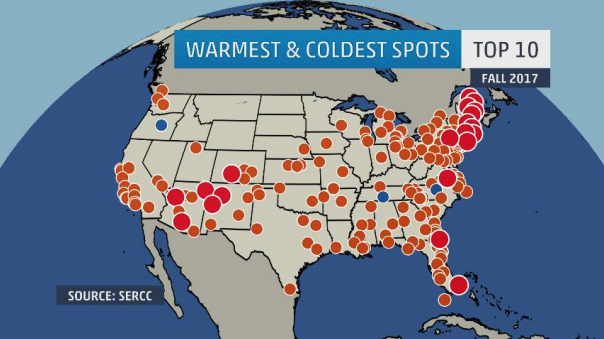 Only five locations had a top 10 coldest November and no one had their coldest. Then there’s fall which was undeniably hot from coast to coast. Over two hundred cities had one of their top 10 warmest falls on record including: Bangor, Miami, and Tucson which had their warmest. Fall 2017 will no doubt go down as one of the warmest on record if not THE warmest. Congratulations to Quillayute, Washington for being the second city this year to make the list in two separate months in the same category. 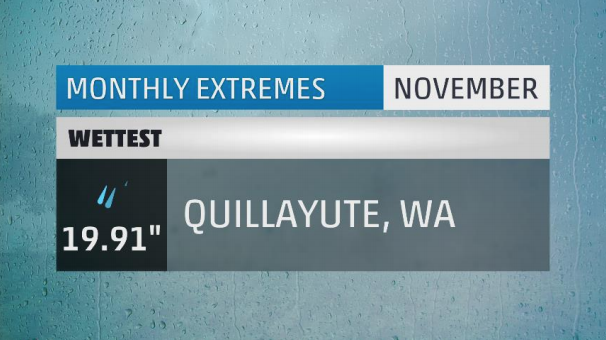 Quillayute is one of the rainiest cities in the US with over 200 days of precipitation per year. This November was their 11th wettest on record with just under 20 inches. Crazy to think that nearly twenty inches of rain didn’t even crack their top 10! Twenty-five days of November saw rainfall which is tied for the 14th most of any November on record. There were only two days the entire month which were completely dry. The 19.91 inches that fell is about four and a half inches above the monthly average. This fall was the 21st wettest for the town. Judging by the amount of brown circle on the map above, you can probably pick up on the fact that this November was dry. 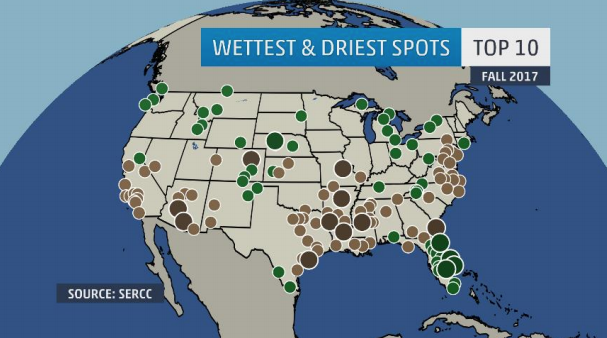 Almost 300 cities had one of their top 10 driest Novembers on record including Las Vegas and New Orleans who had their driest. Aside from one cluster of locations in Ohio which saw flash flooding during some severe weather during the month, not many places can say they had a wet November. This fall was highlighted by tropical activity in Florida and an expansive drought in the lower Mississippi River valley. Irma was responsible for much of Florida’s above average rainfall in early September. Elsewhere, a changeable national weather pattern kept most of the US free from precipitation (or lack thereof) extremes. And now the category that will undoubtedly make me and other snow lovers awfully sad. 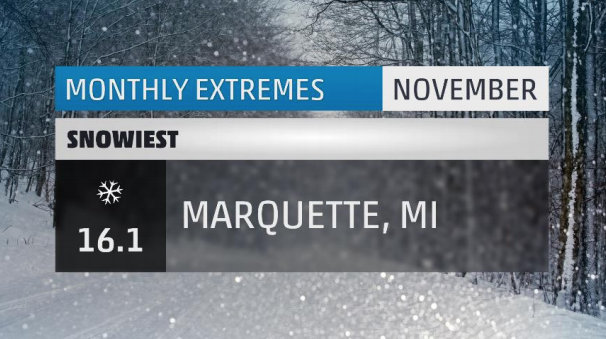 The snowiest place in the entire US during the month of November was Marquette, Michigan. I’m not sad because it’s Marquette, or even Michigan for that matter. No, I’m sad because the snowiest place this month only came up with just over a foot of snow. Historically, November can be an incredibly snowy month. However, November 2017 will be noted for being rather snowless in places we would expect to see widespread snow. Marquette’s 16.1 inches is actually 8.3 inches below the monthly average. Statistically speaking, this was one of the least snowy Novembers in Marquette history. Oh bother. 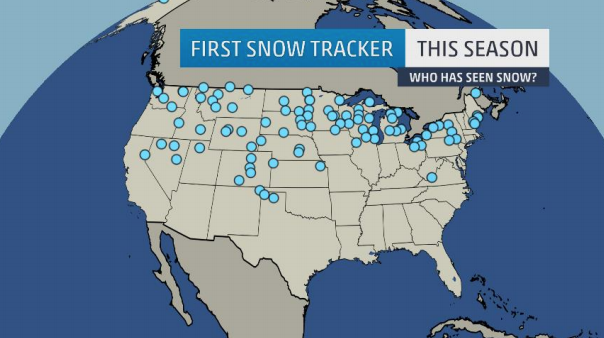 So far this season, a good chunk of the nation has seen snow – just not a whole lot of it. We would end November with 7.6% of the US covered by snow. Compare that to last November where over a quarter of the US was covered by the white stuff. Every November going back to 2003 ended with at least 10% snow cover across the US. This was truly one of the least snowy Novembers on record. Sixteen miles from the US-Mexico border is the town of Imperial, California. This past November, they were the sunniest spot in the country. Of November’s 30 days, 27 of them were completely cloudless while the other 3 only mustered as much as a few passing afternoon clouds. 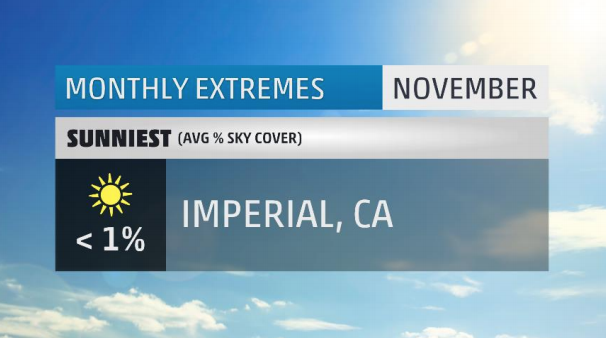 Imperial finished the month 6 degrees above average making for their warmest November on record. Typically, September is their sunniest month while the cloudy season begins in November. So much for averages! We’ll end back in Montana to find the cloudiest place in the US this past November. 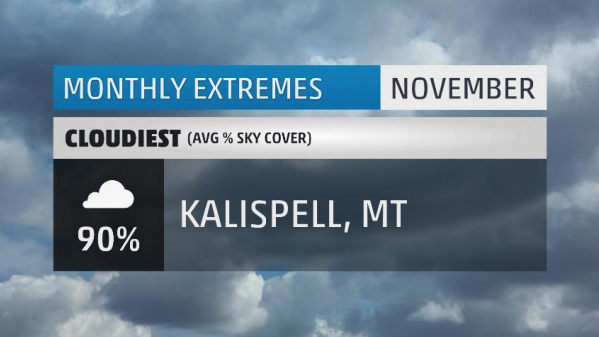 Kalispell averaged 90% cloud coverage on any given day during the month. They had complete overcast on 15 days and were mostly cloudy or worse on 26 days. That left only two days with sunshine the entire month. Kalispell is the nation’s 3rd cloudiest winter city, so they are certainly living up to their gloomy moniker. There you have it, the extremes for the month that was November 2017. Make sure to check back next month to see what December has in store. What weather extremes did you face in November? Let me know in the comments below. There was a lot of extremes this year that’s for sure.